Words that describe Mike Heath: quiet, humble, wise, mentor, leader. 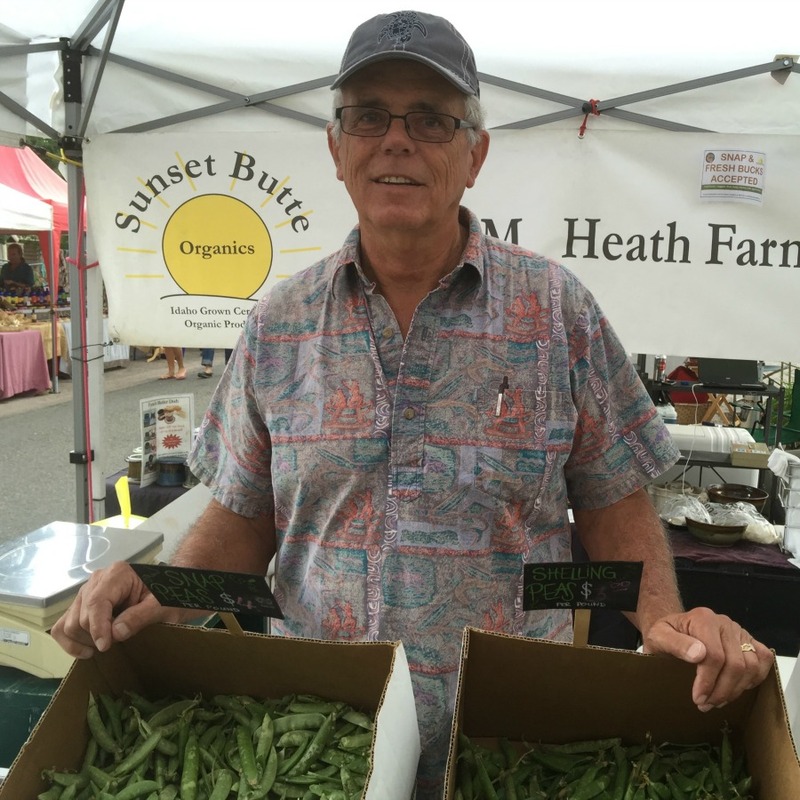 Since purchasing M&M Heath Farms in 1991, he and his wife Marie have grown a successful business that includes more than 400 acres of certified organic products. Since then, he has worked diligently to cultivate his soil and manage pests with sustainable practices such as crop rotation and beneficial insects. Considered an organic farming pioneer, Mike was featured in Michael Pollan’s 2002 book and 2009 PBS documentary The Botany of Desire. You are just now retiring from farming – how does that feel? Mixed feelings—ready to slow down, look forward to doing different summer activities. I will certainly miss farmers’ market customer and vendor connections. I will miss daily farming activities though when here will pitch in, if needed. How long have you been farming – when and why did you get started? I grew up in a rural Iowa setting. I enjoyed visiting and helping on my granddad’s small farm. I started working on local farm in late 50s and worked on a large cow/calf ranch in Oregon when attending University of Idaho. I worked in agriculture and rural development with the United Methodist Church for 10 years in Malaysia and Vanuatu (South Pacific). Marie and I formed M&M Heath Farms when we married in 1991 and, from then on, increased local marketing has been a goal. I guess farming has been in my blood forever. Challenges—uncertain income, weather and weeds(as an organic farmer). Successes—I’ve been a fan of diversity of production and markets and that has proved I can farm organically and stay in business; I have tried new crops that aren’t big in these parts and some have been very successful; We’ve been able to have abundant, good fresh food off our land. The life of a farmer isn’t easy. What inspired you when the going got tough? Other farmer friends, experience and hope. Other organic frontier farmers like Fred Brossy, Nate Jones and Beth Rasgorshek, to name a few. They are very committed to organic agriculture and willing to share. Supply our local eaters with as good and fresh food as possible and keep the dollars in the local community. What are your thoughts on USDA certified organic? What were your “practices” in this respect and how would you advise other farmers – new and existing – around this issue? I support USDA organic certification. It is required when we sell organic produce wholesale. Because of the universal standards and practices set by certification, when a customer sees the organic seal, they can be assured it has meaning and teeth. Local small operations find certifying annoying and expensive and is not worth it as long as their customers trust them and know their practices. My advice to farmers wanting to transition to organic: Take it slow, learn as you go and don’t bet the whole farm on it the first year. “Don’t bite off more than you can chew.” Get to know experienced farmers and talk about practices and markets. It’s a very good life. You are your own boss, thus successes and failures are on you and Mother Nature. It is truly awesome to see how small seeds you plant in the spring turn into such a magnificent harvest. What will happen to the land you have been farming? We only own 18 acres and John Klimes will be farming that with me and continue supplying farmers markets and Idaho’s Bounty. Alvaro, who has been with me for 20 years, will farm one of the farms and keep it organic. My son-in-law Matt will take over management of the other farm as well as Sunset Butte and will continue to manage them organically. Nothing firm yet. Would like to visit family and friends and parts of the country we have never seen in the summer.